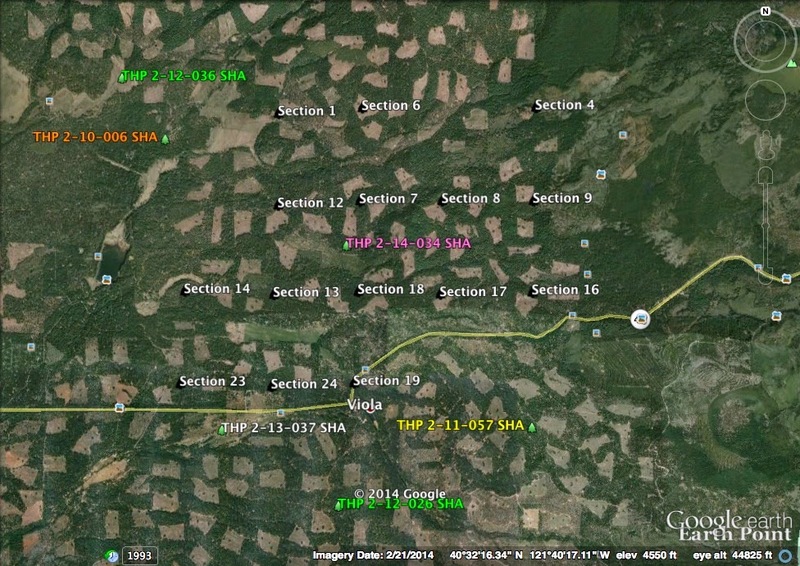 THPBlog: Sierra Pacific Industries to clearcut log near Viola, CA. Sierra Pacific Industries to clearcut log near Viola, CA. This THP is just north and adjacent to the town of Viola and Highway 44 at an elevation of 4,120 to 5,160 feet. Sierra Pacific Industries is planning a mostly clearcut tractor logging operation in white fir, Douglas fir, sugar pine, ponderosa pine and incense cedar forests. There are 20 road drainage sites planned for work including rocking, dip construction and culvert repair and replacement. One osprey nest was reported to be 1 mi west of the THP area, and 3 bald eagle nests were reported to be about a mile away from the THP area at Lake McCumber. There were several goshawk sightings reported to be in the general area, and a historic 1952 Sierra Nevada Red Fox sighting inside unit F1. More information is available on the THP Tracking Center website.